A winey, fruity China Black tea with depth and complexity. Takes milk well. Cup Characteristics: A winey and fruity tea with depth and complexity. Takes milk very well. Of all the China black teas available Keemun Panda #1 is probably one of the best known. Keemun is one of the congou-type teas; meaning it requires a great deal of gongfu, (disciplined skill) to make into fine taut strips without breaking the leaves. Interestingly the characters in the written Chinese script for time and labor are the same as those used for ‘gongfu’. It is often said that a properly produced Keemun such as Panda #1 is on of the finest teas in the world with a complex aromatic and penetrating character often compared to burgundy wines. Traditionally keemuns were used in English Breakfast tea. In the early 1800’s tea was such the rage in England there was a danger that the British treasury would be drained because all the silver was being used to pay the Chinese for tea. The Chinese did not need textiles, one of Britain’s main exports – so what to do??? India and Burma produced significant quantities of opium and in due course China became a major market. The economic circle that evolved was as follows: Opium from India was sent to the British merchants stationed in Canton, China. The Chinese paid for this in silver and the merchants received credits against debts in England. This silver was then used to pay the Chinese for their tea. This practice led to wars between England and China – called The Opium Wars. The last war was won by the British in 1860, which led to opium being a legal commodity in China until 1908 when it was finally outlawed. 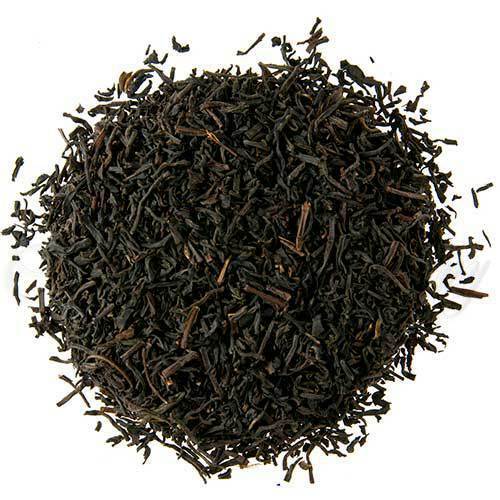 Keemun black tea was only produced after 1875 – against the grain of the Chinese practice of producing green teas. But, the English palate was finely attuned to fine black tea and with virtually unrestricted trade with opium and tea. Keemun rapidly became an English staple, notwithstanding that keemuns were particularly flavorful and full-bodied. Perhaps this interest in keemun also came about as some have described the taste and aroma of keemun’s as reminiscent of toast hot from the oven – another British tradition. Keemun is one the best-keeping black teas. Fine specimens will keep for years if stored properly and take on a mellow winey character.